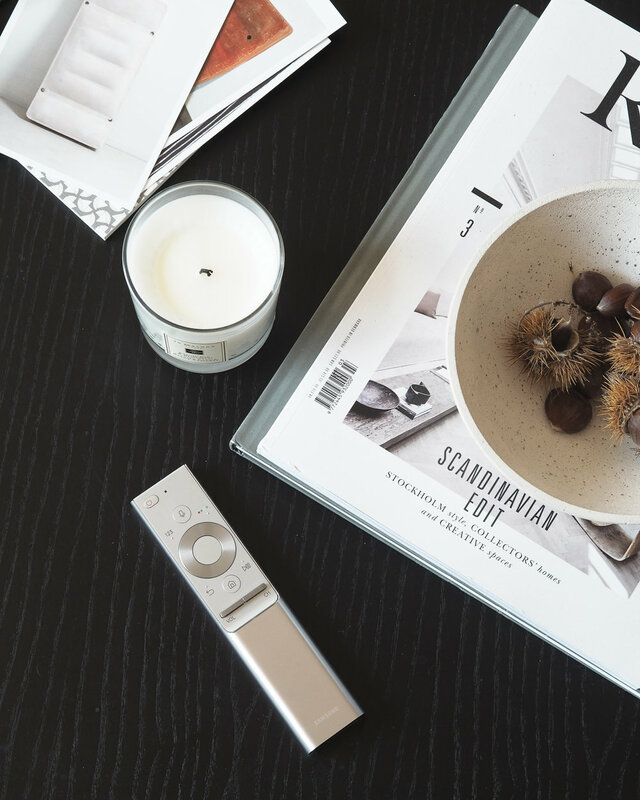 When it comes to home technology we've never felt that we always had to have the latest or the biggest or the best, but we do really love well considered design and so that's the one criteria that everything we choose for our home has to meet. 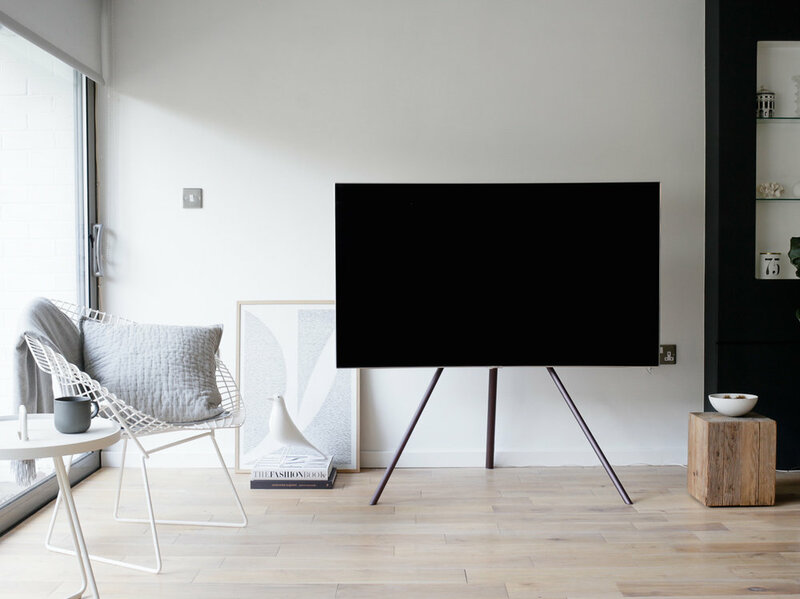 I think often with TVs, and in particular with some of the the larger ones that have become more popular in recent years, people sometimes feel reluctant to allow them to become too dominant within their living rooms. I've been really interested in the way Samsung have addressed this issue over the past few years. 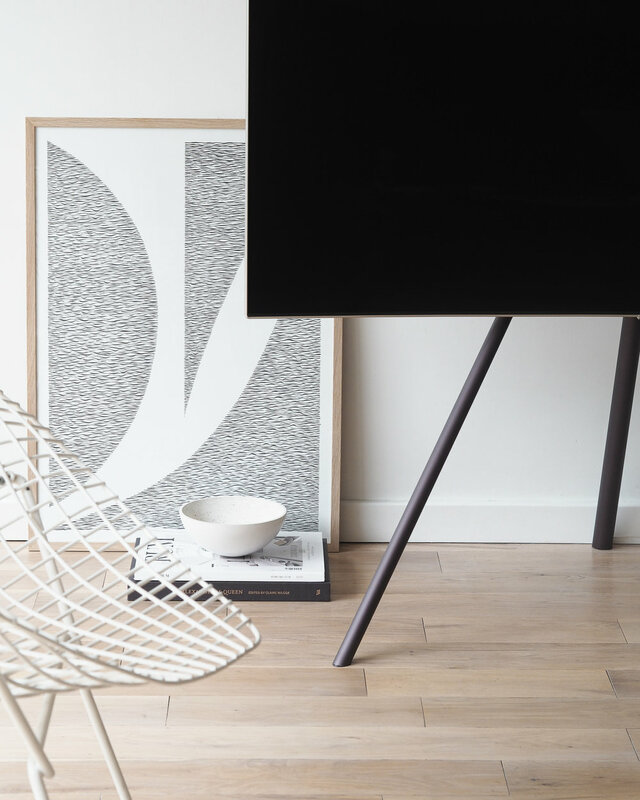 They've brought out a number of new designs that all address the TV's place within the home as a central consideration. So when they got in touch to ask if we'd like to review their new Samsung QLED TV we immediately thought 'yes of course, we'd love to'. Like most people, we watch TV to keep up with the news, learn new things, and be entertained when we need to unwind at the end of a long day. TV is, and always has been primarily something we switch on so that we can 'switch off'. It's immersive rather than physically demanding and we'll happily watch the less demanding stuff alongside more serious programmes when the mood takes us. Taking time out to binge on a good TV series is a modern day affordable luxury. As the lines between work and leisure become more and more blurred, and with social media constantly demanding our attention, we are also easily distracted by other smaller screens. You'll often find us glued to our smartphones throughout the evening with only half our attention focused on the TV. Let's face it the television has some serious competition these days. We were already pretty happy with our existing TV, so what we were wondering was, how different could another one really be? Take a tour of our living room and find out in the quick 60 second video below. The first thing you notice about the Samsung QLED TV is its beautiful stylish design. If you are someone who cares passionately about design you probably instinctively just know when a design is really good. A lot of consideration and work goes into getting things like proportion, clean minimal lines and styling details just right, and the Samsung QLED certainly ticks those boxes - attention to detail is evident everywhere. We chose the 55" curved screen version for our living room (several other options are available) and opted to mount it on the Studio Stand. 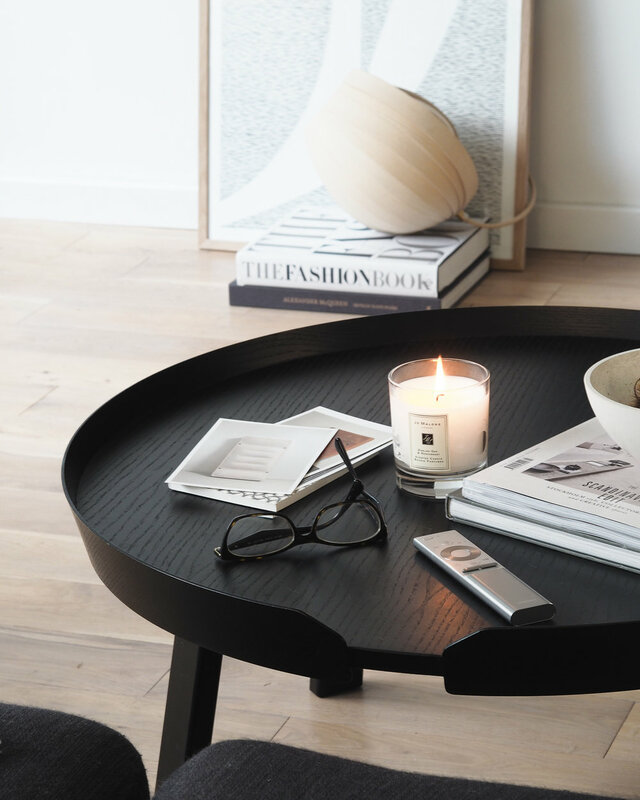 The Studio Stand is stylish, solidly built and perfect for our modern, minimal home. It has the feel of a contemporary artist's easel about it, and makes a strong statement within the room. It doesn't attempt to hide away, and it doesn't need to, we love having it at the heart of our living room as a key design feature. Setting up and attaching the TV to the stand is easy. The TV mounts onto the stand very securely making everything super stable, so there are absolutely no worries about the dog (or anybody else) knocking it over by accident. It's also cleverly designed with a secret removable panel in the rear leg that allows you to route the almost invisible optical connection cable to the power lead inside to cut down on visual clutter. The optical cable then links up to a connection hub. You can plug all your external devices into this and then tuck it away out of sight. This enables you to place the TV anywhere in the room and maintain a stylish minimalist feel - no more unsightly wires and clutter. I really love having a freestanding TV. I work from home and often use our living room for photoshoots or styling projects so I need the space to be flexible. I like being able to move things around, and with this TV I can do just that. I can place it in the corner or move it over to the other side of the room and adopt a completely different configuration within the space. 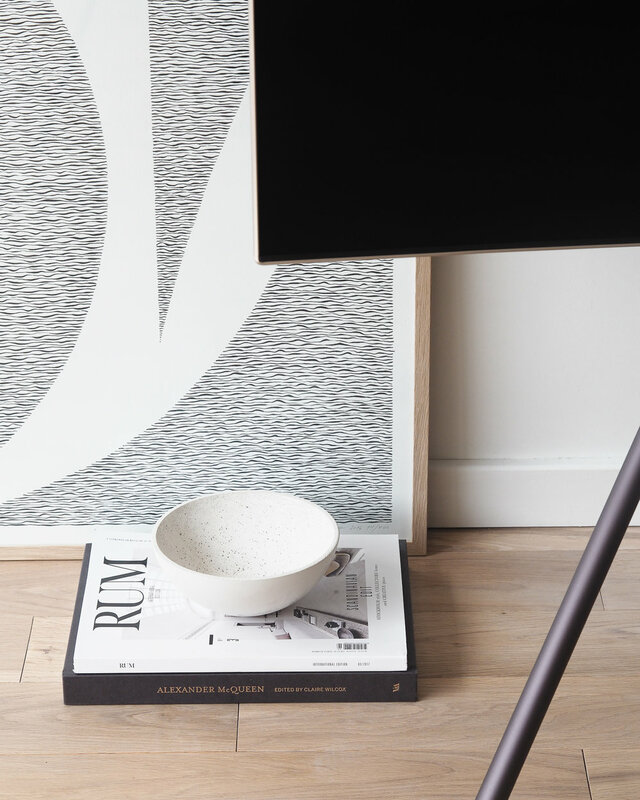 There are lots of other styling options available though, so you can personalise your Samsung QLED TV to suit your space. You can mount it on the wall using a special no gap wall mount that fits almost flush to the wall, or of course you can opt to accommodate it on top of a cabinet or media unit. It comes with a stand that you can use for the latter, but there's also an elegant Tower Stand (available separately). Connecting up to the control box is really easy too. 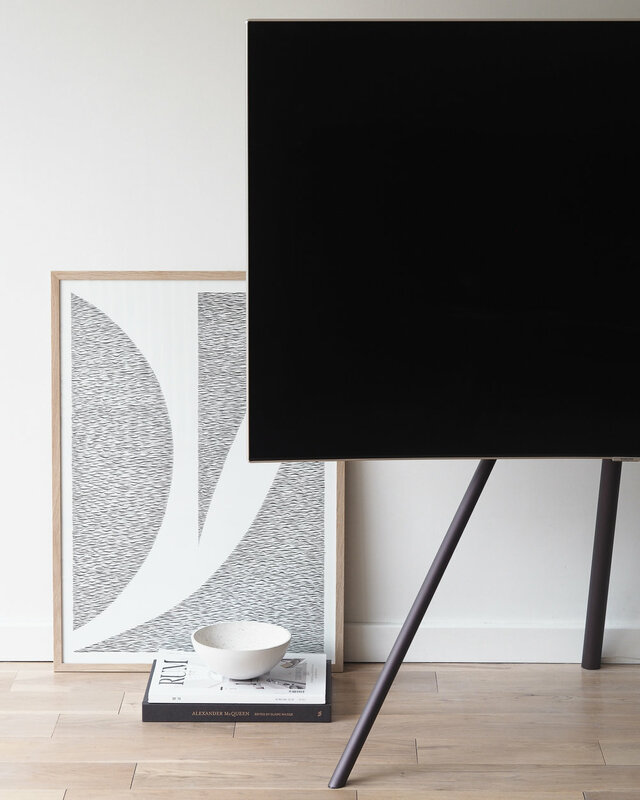 We've hidden ours a few metres away inside our under-the-stairs cupboard and so as you can see all the focus remains on the television only - a minimalist design that looks stunning from every angle. As a result we really love the look and feel that the QLED TV adds to our living room. It's beautifully designed and certainly complements our living space. Turning on and setting up the TV was a completely straightforward and painless experience. 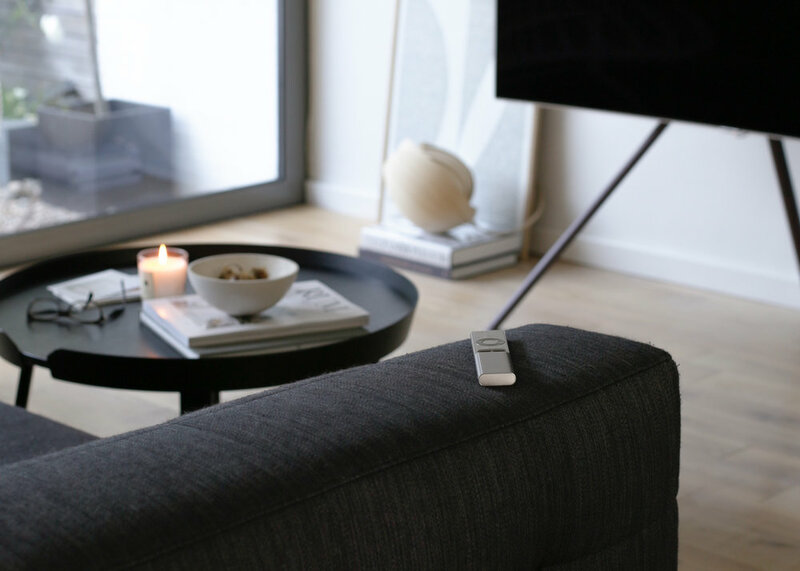 Clad in brushed stainless steel with a thoughtful and simple button control layout that is a joy to use, the ultra sleek Samsung OneRemote is a thing of beauty in itself. Every time you pick it up you are reminded how well considered absolutely everything about this television really is. 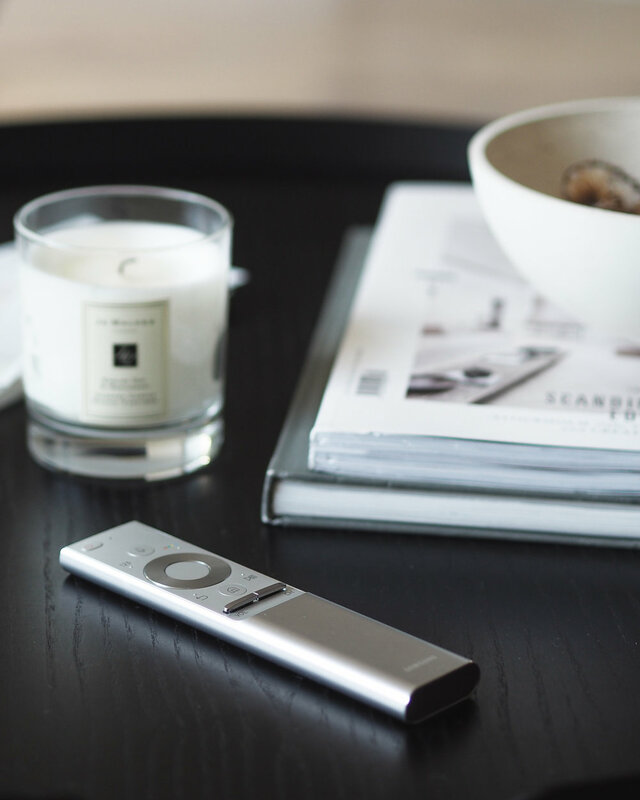 It allows you to easily control all of your connected devices so you avoid the need for multiple remotes (again, no more clutter). You can use it to quickly access everything from streaming services to gaming as well as setting alerts for your favourite programmes via the on screen Samsung Smart Hub. And in doing so you'll never be more than three clicks away from the content your looking for. You can connect other devices up to the control box so we've used it to link up an external hard drive or USB stick so that we can view our own content. It's amazing to be able to view pictures or video we've taken on such a high quality screen. And wow, what a picture quality it is. In fact even 'wow' doesn't seem an adequate description for what is a pretty mind-blowing experience. Samsung have produced 100% colour volume resulting in an incredibly detailed picture that is viewable from any angle. The QLED TV automatically adjusts the brightness of every scene, while also minimising light reflection and glare on the screen. This ensures impeccable contrast in a wide variety of lighting conditions. All this technological magic is fed down a tiny near invisible fibre-optic cable into a beautifully designed bezel free screen that ensures your viewing habits (and expectations) will be changed forever. There's definitely no going back now that's for sure! Literally overnight we found we'd suddenly become HD snobs and so now if the programme, series or film on offer isn't available in high definition (luckily most are nowadays) , then we'll seriously consider changing over to another channel to feed our immersion addiction. The Samsung QLED is actually UHD ready, so with an increasing number of broadcasters and streaming services now offering UHD we'll be able to experience the very latest in ultra high definition content too. It's even changed our viewing interests and we've discovered a renewed passion for natural history programmes and travel documentaries, both of which are a visual feast to truly delight in. So how has Samsung achieved such amazing results? The answer is through true technological innovation. The QLED TV delivers the highest brightness to date with exceptional picture detail by utilising a layer of nano-sized particles called 'quantum dots'. These dots turn light into colour, creating a viewing experience made of a billion colours at 100% colour volume. This is achieved by adding light to the colour volume to massively increase the available colour spectrum. If you love colour, you will love this TV - it brings colours to life in an incredibly vivid and intense way. The result is an image quality with a depth and realism you can easily lose yourself in. Action scenes become incredibly visceral and if you are viewing a beautiful landscape you literally feel as if you are right there. As an unexpected benefit of such immersion, Graham and I have found that we now tend to put our phones aside and give whatever we are watching our full attention. So we're now enjoying more quality time relaxing together and communicating with each other through a shared viewing experience. And so back to our original question - how could a new TV be that much different from our previous one? The answer lies in an innovative, considered and stylish design which both complements our lives and our living space as well as an immersive experience and a picture quality like no other we've known. The Samsung QLED television has successfully managed to put the TV back centre stage in our home. It's revived the art of television as a medium worthy of our complete attention again, and we genuinely love it. More information on the Samsung QLED television here. This is a sponsored post in partnership with Samsung.